Click here for in-depth examinations of each of Alabama’s rivers and their respective watersheds, from Auburn University. What is a watershed? Click here to find out! Alabama has 3,627,600 acres of wetland and 563,000 acres of ponds, lakes, and reservoirs. 33.5 trillion gallons of water are withdrawn annually from streams, rivers, and reservoirs to supply drinking water to 56% of the population in Alabama. There are 16 hydroelectric power dams and 16 navigational dams (5 of which are also hydroelectric) in Alabama. The Southeastern United States has the world’s greatest diversity of temperate freshwater fishes. 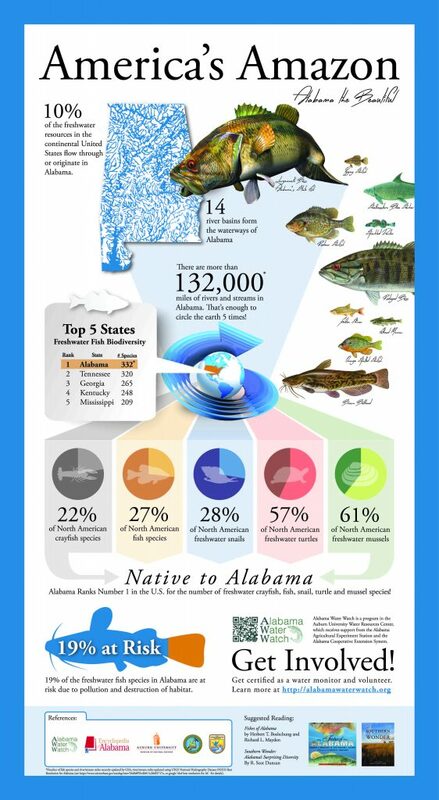 Alabama has 303 freshwater species of fish, 20 of which are endemic to Alabama. 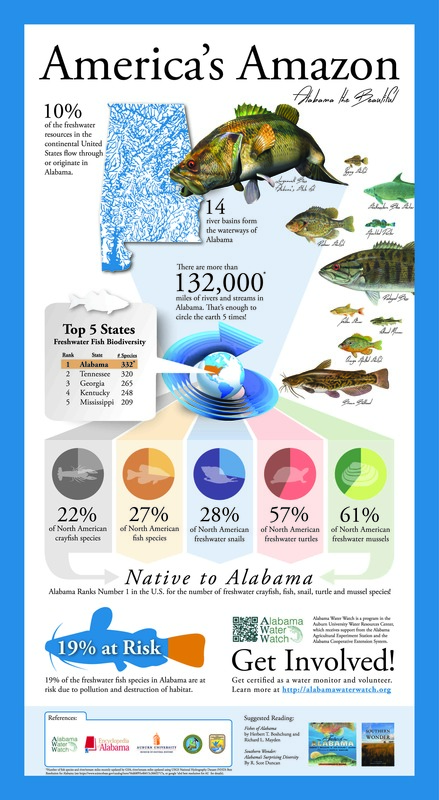 Alabama’s rivers are among the most biologically diverse waterways in the world. 38% of North America’s fish species, 43% of its freshwater gill-breathing snails, 51% of its freshwater turtle species, and 60% of its freshwater mussel species are native to Alabama’s rivers. There are more species of fish in the Cahaba River alone than in the entire state of California! Consider the economic value of clean waters. The Alabama Fisheries Association estimates that Alabama’s water based recreation industry brings over $1 billion per year into the state’s economy.